Legends seem to converge at the Ermitage du Pic St-Loup. The hermitage dates back from the Middle Ages, as the former home of the bishops of Maguelone. The limestone peak or "pic" perched above the vineyards was named for the legendary Saint Thieri Loup, one of three pious, crusading, brothers and suitors to the beautiful Bertrade--after her untimely death, Loup became a hermit. In 1992, the Ravaille brothers (Xavier, Pierre, and Jean-Marc) joined forces to plant a vineyard in what has traditionally been land dominated by sheep farming and cheese production. The Ravaille family has been in the Languedoc for over one thousand years, long enough to have known Saint Loup personally. These brothers have been on a noble quest of their own to create serious wine that expresses the complexity of their terroir. The three fish on the label's emblem therefore not only evoke the story of Saint Loup, but also their fraternal collaboration. Within the first few years, the Ravailles came to the conclusion that introducing biodynamic farming practices would allow them to make the wine they wanted. 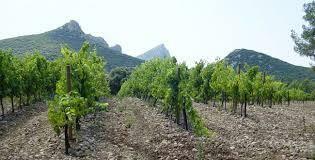 Though they have been using this methodology since 1999, as of 2012 vintage they are certified organic. The wine leads off with lively fresh dark berry fruits and follows through with notes of game, smoke and black pepper balanced with fine acidity and soft round tannins. An exceptional wine and a great value.